Armed Irish republicanism has been around in various guises for centuries: the Protestant rebel Wolfe Tone, who died in the 1798 rebellion, is today revered as its founding father by the I.R.A. and others. Acting in his tradition, a variety of small groups cooperated in 1916 in a rising to end British rule in Ireland. Their rebellion was not itself a success, but sparked a war that led to the British withdrawal from what is now the Republic five years later. In the decades that followed, a republican underworld of small handfuls of quixotic activists continued to exist. Splits were frequent, often in left-right terms, and on the question of whether to participate in politics or boycott them. Another fault line concerned the question of whether their prime purpose was to push the British out or to defend vulnerable Catholics against extreme loyalist attack. An I.R.A. campaign that began in 1956 petered out ignominiously, apparently consigning the organisation to history. Yet in 1969 it sprang into life again, to grow into one of Europe's largest, most active and longest-lasting violent groups. Its activities continued for almost four decades, taking 1,700 lives in Northern Ireland, Britain, the Irish Republic and the continent. If there is one single place which symbolises its 1969 rebirth and growth, it is Bombay Street in the Falls Road area of Belfast, where marauding loyalists burnt down much of the street and killed a junior I.R.A. member. The initial emphasis was on defence, the I.R.A. vowing to protect areas open to loyalist attack. But soon the organisation was squaring up to the Army, while loyalists remained lethally active and the situation inexorably deteriorated. By 1972 the I.R.A., loyalists and the security forces were involved in large-scale clashes, with 500 people killed in that year as the I.R.A. switched the emphasis from defence to an aggressive campaign aimed at British withdrawal. The spiral into violence was marked by security force mistakes and misdeeds such as internment without trial and the shootings of Bloody Sunday in 1972. Loyalists committed many killings, sometimes torturing their Catholic victims in the back streets. For its part, the I.R.A. invented the car bomb, a device which claimed many civilian lives. In one of many such incidents, known as Bloody Friday, nine people were killed in Belfast in 1972 when the I.R.A. detonated 20 devices in just over an hour. That incident produced one of ghastliest images of the Troubles, with television pictures showing mangled human remains being swept into plastic bags. But it was not to be the last such atrocity: every year that followed brought destruction and deaths, amounting to 3,700 killings in all. The I.R.A. was responsible for almost half of these, and itself lost hundreds of members and supporters. The decades brought various phases of I.R.A. activity, marked with what republicans called 'spectaculars.' One of these was the assassination of Lord Mountbatten in 1979, on the same day that 18 soldiers were killed at Warrenpoint in Co Down. The I.R.A. 's weaponry included handguns, rifles, machine guns, large bombs, boobytrap devices, mortars and rockets; and it may also have deployed S.A.M.-7 anti-aircraft missiles. It used its weapons to kill soldiers, police, prison officers, judges and magistrates, tradesmen who helped to repair police stations, politicians, alleged loyalist extremists, alleged informers, and many civilians. At one point it invented 'human bombs,' strapping people who worked for the security forces into vehicles containing large devices and forcing them to drive to security force installations, where they were blown to smithereens. In return, the security forces killed many I.R.A. members, including eight in Loughgall, Co Armagh, and a further three in Gibraltar in S.A.S. ambushes. Perhaps 10,000 republicans wound up in prison, some of them serving almost two decades behind bars. The I.R.A. 's political wing, Sinn Fein, was in the early years little more than a propaganda outlet, but it grew in importance after the emotive hunger strikes of 1981, when Bobby Sands and nine other republican prisoners starved themselves to death in the Maze prison. 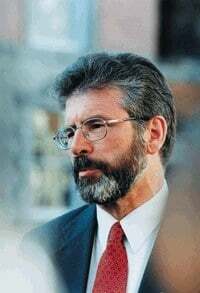 By that stage, the republican movement was in the hands of a new northern-based leadership dominated by Gerry Adams and Martin McGuinness, who had pushed out the older southern leaders in a bloodless coup. The I.R.A. was reorganised to make it a smaller, tighter organisation less vulnerable to penetration by informers. In 1984, an attempt was made to kill Margaret Thatcher and members of her Cabinet who were staying at the Grand Hotel in Brighton during the Conservative Party conference. She survived but five people died in the attack. In the late 1980s, the I.R.A. received a huge boost with the arrival of sizeable arms shipments from Colonel Gaddafi's Libyan regime. This material, which included machine guns and Semtex plastic explosives, greatly increased its capacity for violence. More shootings and bombings resulted, but so too did enhanced efforts by the security forces. 'The Brits have raised their game,' an I.R.A. leader said at the time. The I.R.A. then began putting out feelers to the British Government and to Irish political and clerical leaders. There had been surreptitious contacts in the past, most notably when the Government flew Gerry Adams, Martin McGuinness and others to Chelsea in 1972, in an R.A.F. aircraft, for secret discussions with the Northern Ireland Secretary, William Whitelaw. Those talks came to nothing, but in the 1990s the I.R.A. began to signal that it was interested in dialogue. But the fact that the organisation insisted on maintaining its campaign of violence during this period meant that many did not take its approaches seriously. John Major was understandably unimpressed when a republican letter asking for dialogue was delivered at around the same time as a mortar-bomb attack shook his Downing Street cabinet room. The I.R.A. 's 'complete cessation of military operations' in 1994 was a giant step, but it returned to violence in 1996 with the Canary Wharf bombing, complaining that the Government had not brought it into dialogue. A second ceasefire followed Tony Blair's arrival in Downing Street in 1997. But even after the Good Friday Agreement of 1998, the I.R.A. felt free to carry out occasional unacknowledged killings and bank robberies. This was partly because the British and Irish governments believed in the bona fides of Mr. Adams and Mr. McGuinness, and considered that republicans should have time, and some indulgence, to make their journey into pure politics. Mr. Blair in particular drew criticism for appeasing terrorists who had no intention of giving up the gun. Looking back on the I.R.A. 's record demonstrates what a huge risk he took in believing that such an organisation could be persuaded to embrace politics. For decades, the authorities tried to beat the I.R.A., but never managed it: now the organisation is voluntarily offering to disarm, and to put an end to the toll of violent death.